The mission of the Mercy College Graduate Program in Physician Assistant Studies is to educate physician assistants to provide quality, cost-effective, accessible health care, especially to underserved patients in the Tri-state area. 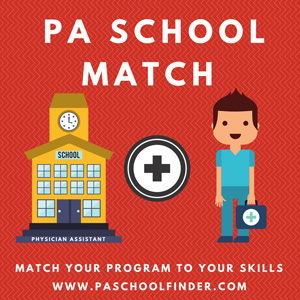 A minimum of 500 hours of direct patient care (volunteer or work) experience in a health care setting, along with proper verification forms, are required for the PA Program. Additionally, 250 hours of the 500 hours must be completed in a primary care setting, e.g., outpatient internal medicine, family medicine, pediatrics or OB/GYN. The Jefferson School of Health Professions is committed to educating healthcare professionals of the highest quality and ethical standards for contemporary practice in the global community. The mission of the Graduate Professional Physician Assistant program is to provide a comprehensive curriculum that educates students to become providers of quality, evidence based medicine that encompasses the ethical, socioeconomic, and cultural sensitivities of each individual patient. The program will provide students with the motivation and skills to distinguish themselves as innovators and leaders in their field. Our vision is that our graduates will be leaders in the health care community, health care technology and clinical practice, continuously striving for excellence in their professional careers. The Division of Physician Assistant Studies supports the University’s mission by educating men and women of all ethnic and socioeconomic backgrounds in the art and science of medicine so that they may become highly competent and compassionate physician assistants.The program will advance medical knowledge and contribute to the PA profession through research and other scholarly endeavors. Our program seeks to educate individuals in becoming knowledgeable, compassionate and spiritually uplifting healthcare providers. Whether they practice locally, nationally, or globally, the PA program graduates individuals who embrace a mission of service to others.